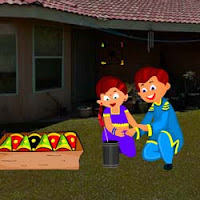 Escape to Diwali, is the new point and click escape game from Ajazgames. Chottu , is happy to celebrate Diwali with his friends and family. He want to put crackers in the night, he missed the sparklers help him to find the sparklers. By finding clues like laddus, lamps and to solve puzzle. All the best, Wish you Good Luck, have fun playing escape games, point and click games, new escape games, free escape games and free online escape games from Ajazgames.